Review of Friedrich Winter, Friedrich Schauer 1891-1958. Seelsorger – Bekenner – Christ im Widerstand (Berlin: Wichern Verlag, 2011), 215 Pp., ISBN 978-3-85981-326-8. Friedrich Schauer was one of the cohort of German Evangelical pastors caught up in the religious, political and military disasters which engulfed Germany in the first half of the twentieth century. This short sympathetic account, written by a former church leader in Berlin, successfully describes the conflicts of loyalties in which these pastors were embroiled, and which in many cases strikingly affected their careers. 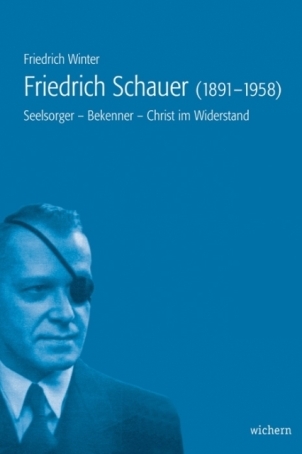 Schauer was not a leading figure, but, for that reason, his biography can be seen as typical of many of his colleagues. He had just completed his training when the First World War broke out. Within weeks, he was badly wounded in battle and lost the sight of his left eye. Nevertheless he was able after the war to take up parish work, first in East Prussia and then in Pomerania. Due to his conservative background and his military training, he early on opposed the more radical wing of the so-called “German Christians” who called for the adoption of Nazi ideas and practices in the church. Consequently he was a strong supporter of doctrinal orthodoxy, as expressed in the famous Barmen Declaration of 1934. But later he was disillusioned by the rigid dogmatism of those who followed Niemoeller and Bonhoeffer and refused any obedience to the established church authorities. Schauer wanted to maintain a more moderate position, rejecting extremism on either side. He became involved with the Brotherhood of Michael, a group of clergy who laid emphasis on a more liturgical church life, but avoided political engagement. One of the leading figures in this movement was Theodor Steltzer, who had been Schauer’s commanding officer in the First World War, and was to become the same in the Second. In 1939 Schauer was again called up as a transportation officer, and served under Steltzer first in France and then for more than four years in Norway. Here he was able to establish friendly relations with some Norwegian clerics and sought to mitigate the effects of the German occupation. At this point Steltzer became increasingly critical of the Nazi leadership, and indeed became associated with the Kreisau Circle led by Graf Helmuth von Moltke. But it is not clear to what extent Schauer shared these opinions. Following the failure of the July 20, 1944 plot, Steltzer was arrested and arraigned for high treason. (Fortunately, he survived.) Schauer, still in Oslo, must have taken all steps to destroy any evidence of his real sympathies. Only one paper survives in which he outlined his views on the future of Europe and the role of the church, along the conservative even authoritarian lines adopted by the Brotherhood of Michael. Such a stance was enough for him to be ordered dismissed from military service. But at the beginning of April 1945, instead of returning to Germany in disgrace, he fled to Sweden and sought asylum there. Luckily his friends in ecumenical circles supported him there for eighteen months until he was finally allowed to rejoin his family in West Germany. Schauer’s post-war career was unpropitious. It seems his theological and political views found little favour in the reconstituted German Evangelical Church. Ill-health, caused by his war wounds and compounded by the loss of two of his sons on the Eastern Front in 1943, obliged him to take early retirement. He died shortly afterwards. This informative memoir is therefore rather a tragic story, but reflects the fateful experiences and the ambivalent stances of so many of these now forgotten pastors.